Hello! Did you see Gina surprised us all with a 2 day pre-Christmas sale today?? Thirty percent off lots of Christmas themed, stamp sets dies, and papers woo hoo! I have several Christmas-y sets included in this sale, and was inspired to get out Festive Frame for this week's video! Today I am sharing the black magic technique with the Frame stamp on black cardstock with gold embossing and Prismas! The gold on black is so festive and elegant for the holidays or any time, and the colored pencils add so much pop on the dark background! 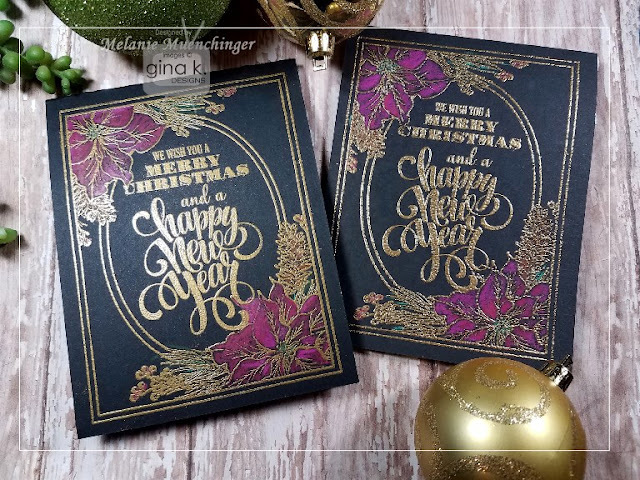 You can also try this technique with a navy, dark gray or chocolate cardstock, and swap out the gold for silver or white to change up the look! 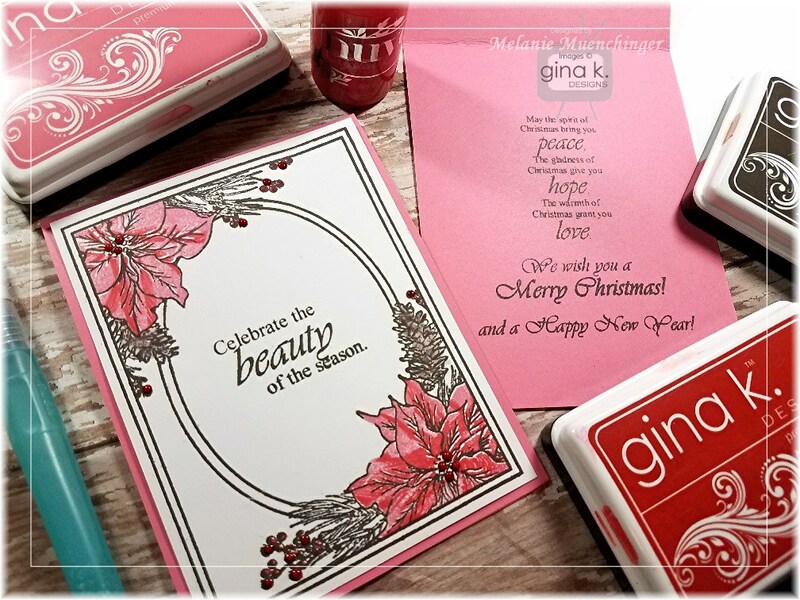 Greeting is from Merry and Bright stamp set, also from Gina K. Designs. Sale is through the end of December 19th, 2017 only! While supplies last! No need to add a coupon code, discount has already been applied. Happy shopping and Merry Christmas! It's a GREAT time to purchase for next year’s cards, gift to a stamping friend, or buy a little something for yourself!! Please enjoy! Gina K. Pure Luxury Black Onyx cardstock 4 1/4" x 11", scored at 5 1/2"
"Just wanted you to know that Asher is doing, just so wonderful. He's acting completely normal! Just like his old self. Praise God! Please update if you want 🙂 we can feel and see the prayers here!" Hello! 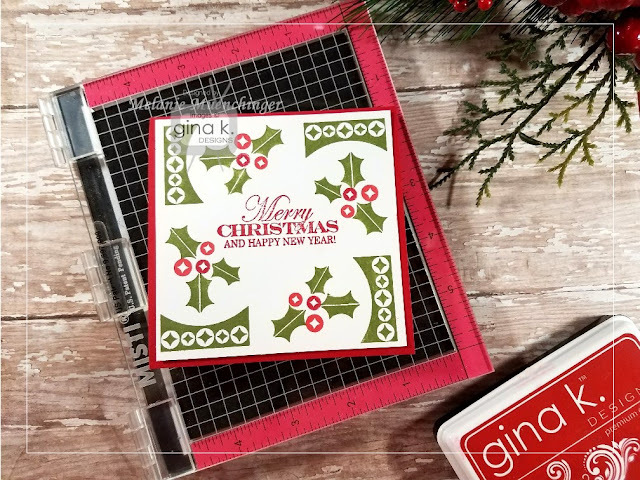 Today I am sharing a rotation stamping technique with the Mini MISTI and elements from my Fabulous Holiday Labels stamp set. You can create fast and fabulous symmetrical patterns with these two step elements, creating bold graphic designs or cozy looking quilt block patterns, perfect for your winter holiday cards, or any time! Please enjoy, and watch to the end for an advent idea for this set, along with a special message from me about our friends who are in need of prayer and encouragement this Christmas. Appreciate your help in lifting them up! You can read more about them here. ALL my stamps sets I've illustrated for Gina K. Designs that are currently available can be found in this link. I am donating a portion of the proceeds from the purchase of every one of these sets from December 1-31st, 2017 to Asher and his family. Thank you in advance! And thank to those who have already reached out, God bless you for your love and concern. Apologies for any confusion I might have caused when I referred to this set as Fabulous Holiday Fillers at the beginning! That is a real set, and one that coordinates but this one is "labels"! So many coordinating sets I can't even keep them straight sometimes! Friends, cardmakers, prayer warriors, I desperately need your help, please read. PLEASE help me lift a dear couple who are friends and coworkers of my husband, Miranda and Dustin, and their son Asher. Asher was born at just 24 weeks last year, under 2 pounds. After several months in the hospital, he was finally able to come home. You can read about their journey earlier getting him strong and healthy to leave the hospital in the months after he was born on her blog: www.bigboyasher.com It was such a privilege to read her daily updates as they celebrated each small milestone and every ounce he gained! (I need tissues every time I read the letter on the first page they wrote for him after he was born.) Since then, he’s always had the health challenges a micropreemie faces in early development, but otherwise a sweet, happy boy, just like his name. Then, a few months ago, he had a fall which prompted them to do a brain scan, just to be on the safe side. Unexpectedly, the scan showed a mass in his brain, unrelated to the fall. Surgery to remove it revealed several more tumors that did not show up in the scan, and the biopsy revealed cancer. He is now 18 months old. The doctors are offering virtually no hope of recovery with treatment, and that his time is most likely short. That is really all the detail I can provide here, but they know I am sharing this. No advice or referrals needed as they've explored everything available thoroughly, but they are hoping for a miracle. Understandably, Miranda has not been able to update the blog in awhile (as they have been getting second , third opinions, spending every moment they can enjoying their time with him, celebrating Christmas early, etc) but it will give you an idea of their hearts and faith. Both being employed by the same company, huge medical bills and needing time off is also adding up, although the company and its employees have been amazing in donating their vacation time etc. They just don’t know the extent of what their expenses will be or when they will able to get back to their jobs. Three way YOU can help, anything is welcome and appreciated: 1. PRAYERS. Please pray for blessings on this family and MIRACULOUS healing for Asher. Wisdom, comfort and peace in the days to come. That this family time is sweet. For God to reveal Himself in a mighty way. The family is also having a prayer vigil tonight at their church at 6PM and know that will feel the love and support of *every one* of your prayers. And keep praying! 2. CARDS. You can send me a private message if you would like to send a card or note to encourage his parents, and I will reply with their address. Thank you in advance for doing this, our wonderful cardmaking community always comes through! 3. FINANCIALLY: Paul and I have decided to donate a portion of the proceeds for every one of MY stamp sets sold in the month of December to this family. You can find ALL my sets available for purchase here: http://www.shop.ginakdesigns.com/category.sc?categoryId=32 There is ALSO a paypal link on Miranda’s blog which I shared above if you prefer to donate that way. Today I am sharing how to make some beautiful Christmas card in no time with my bestselling Festive Frame set, back in stock! I demonstrate a fun direct to stamp technique for making striped poinsettias in the frame with a bold image from my coordinating Pressed Flowers set. Please enjoy! I Watch to the end for a different layout, and let me know which you prefer in the comment section below. I apologize for a little clumsiness this week, I got a deep cut in my finger* but didn't want to skip creating a video for you! Makin' it work! Good morning! Today the design team is hopping with some gorgeous ideas for all the new Foil-Mates™ products from Gina K. Designs! We will be giving away a $25.00 gift certificate to one lucky commenter so be sure to visit all the stops and comment on each post for more chances to win! The winner will be posted in the Big News Forum a few days after the hop. Today I have a simple card and some packaging ideas! My holiday cards are usually pretty clean and simple because let's face it, there are a lot to distribute! Hope this inspires what you can make when you need cards or packaging in pinch! Here is a simple card using the Foil-Mates™ Tag Tidings, Decorative Tag die, and some of the White Fancy Ribbon. I like to cross the ribbon on the back and then in front so that it makes 4 quadrants, which looks like festive package under the tree! Tie on the foiled tag and and your holiday is shining! 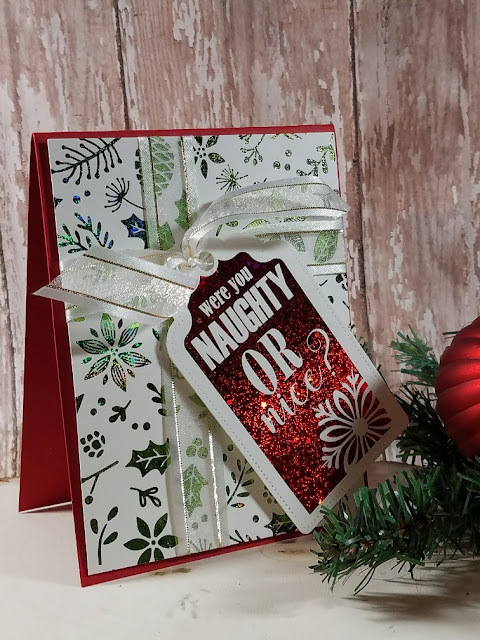 Love the "...naughty or nice"! The Radiant Red Fancy Foil™ is stunningly beautiful, like ruby slippers! You just have to see it in real life! Card base is the coordinating GKD Pure Luxury Red Velvet. 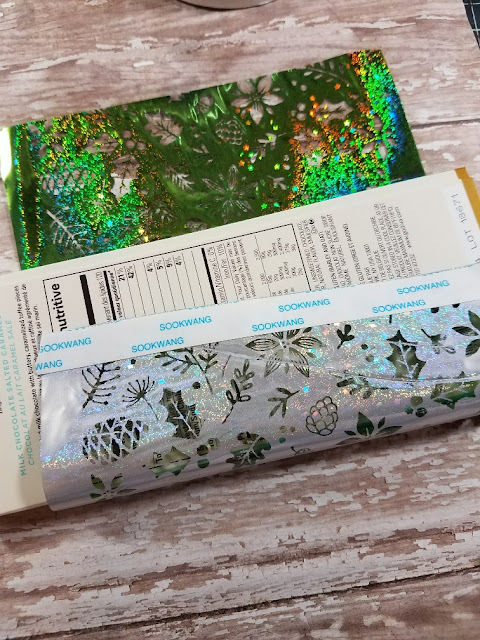 I used the negative pieces of Fancy Foils™ (Glittering Green and Sparkling Silver ) from my other projects today to wrap around these candy bars! 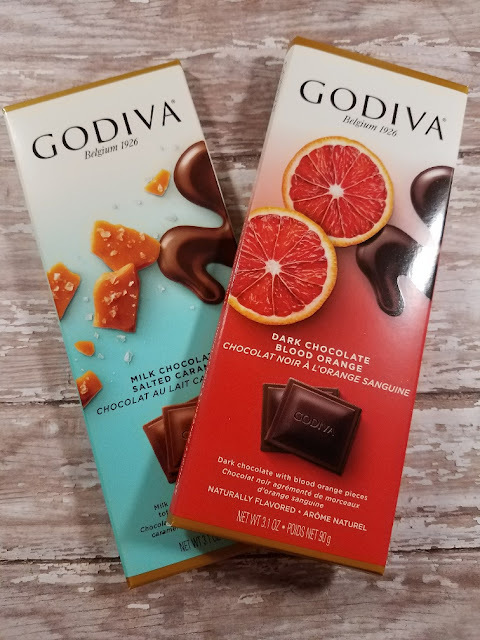 You can do a simple Hershey's or make it a little fancier and not much more more money with some interesting flavors and the like! I wrapped it right around the Godiva bar, letting the branded wrapper peek through (kind of a surprise, but also kind of a spoiler!) and secured with some Scor-Tape. Tip: Although I used the green side for the card I shared above, I liked how the back side of it looked better over this baby blue printed bar, still very silver and sparkly! So all the foils are kind of a "two-fer" when you are using up your scraps and negative pieces, fabulous and fancy front or back! Note: You cannot make the foil underside adhere to the toner printed pages, I tried out of curiosity just to see what would happen! Just wanted to share that if you were wondering if you could substitute a colored foil piece like red and make it foil the pattern with the underside in silver, know what I mean? 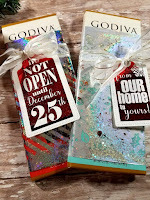 Finally, add a foiled tag (Tag Tidings) and boom! Greeting and gift, done and done! This is a nice way to use your negative foil pieces without having to do spray adhesive to adhere it to more cardstock. Cost effective easy and very pliable wrap! 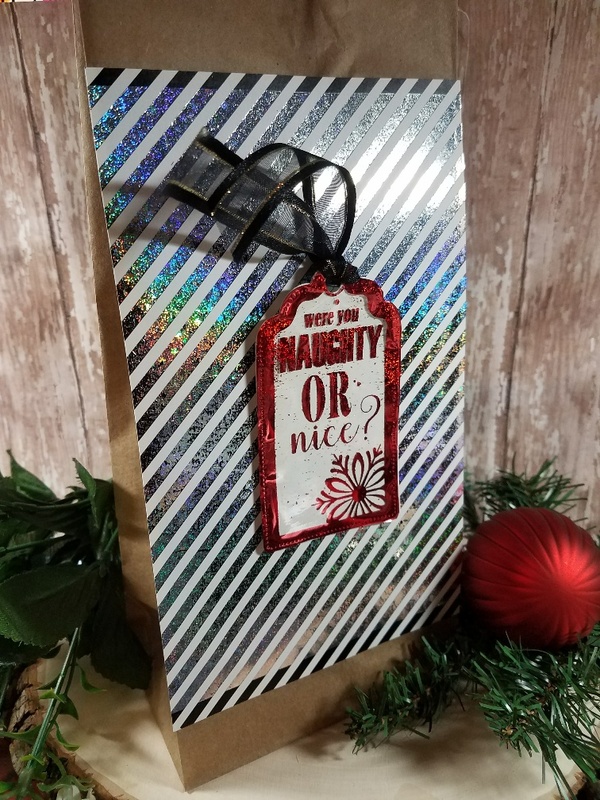 I also used the whole sheet of foiled Foil-Mates™ Backgrounds Ornamental Holiday, trimmed just a bit, and stuck it to brown bag with Scor-Tape. The patterned sheet was slightly longer than the foil, so I centered it before running through my laminator so the black edge (the unfoiled pattern) would make a nice contrasting border at the top and bottom. Add a foiled tag with Fancy Ribbon , and boom! Fancy bag and tag, done and done! On this one I used the negative piece of foil and die cut a plain white tag to layer it over. no adhesive needed since I pulled the ribbon through the hole! Now let's see what the rest of our talented team has for us! Video: Fabulous Merry & Bright Holiday Labels!